Information and images for millions of products globally. Search information of any products - instantly! At Barcode Live, just by typing in the item's barcode number, you can find information for millions of products on the world: photos, name, model, manufacturer and product reviews. With huge database of barcodes and product data as well as from retailers and e-commerce sites, we will bring you the most useful and clearest info on any product you're interested in. UPC consists of 12 numeric digits, that are uniquely assigned to each trade item, widely used in the United States, Canada, United Kingdom, Australia, New Zealand, in Europe and other countries for tracking trade items in stores. EAN is a standard describing a barcode symbology and numbering system used in global trade to identify a specific retail product type, in a specific packaging configuration, from a specific manufacturer. The most commonly used EAN standard is the thirteen-digit EAN-13. ISBN is a unique numeric commercial book identifier, is assigned to each edition and variation (except reprintings) of a book. Publishers purchase ISBNs from an affiliate of the International ISBN Agency. A barcode is an optical, machine-readable, representation of data; the data usually describes something about the object that carries the barcode. Traditional barcodes systematically represent data by varying the widths and spacings of parallel lines, and may be referred to as linear or one-dimensional (1D). Later, two-dimensional (2D) variants were developed, using rectangles, dots, hexagons and other geometric patterns, called matrix codes or 2D barcodes, although they do not use bars as such. Initially, barcodes were only scanned by special optical scanners called barcode readers. Later, software became available for devices that could read images, such as smartphones with cameras. Check out our free mobile apps (both Android and iOS devices) for all the product info in our huge barcode database. These mobile apps give you instant access to the millions of barcodes in our system, along with all the product info: photos, name, model, manufacturer, average price, detailed features and product reviews. 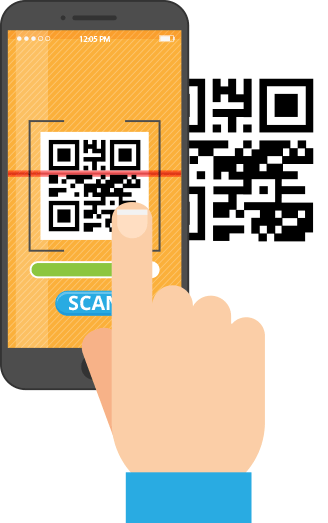 Just scan the barcode with phone's camera, app will return accurate result of product you're interested in.